HTC has been known for highly-priced products, especially the flagship smartphones such as the HTC One M8 this year, but the company hasn’t kept the fans out of options, because the company did release a cheaper alternative with this, with a few compromises but the internal specs are kept the same, and so is the display. Overall, there are two-sided thoughts for the HTC One E8, which came in a surprisingly killer price because of the specifications, but there are a couple deal breakers, one of the is the build quality. Read the review below, to know our thoughts. This is rare, at least from HTC that you get to see a smartphone from a Tier-1 brand being sold at a decent pricing in India. It is only Motorola who is known for such cheap-in-price but great-in-value products in the recent times, but HTC One E8 is impressive for the price. The 5-inch display is the same as is in the HTC One M8, and the internal specs are top notch. But where did HTC compromise? the main difference is with the build quality and material. It is a plastic exterior on the HTC One E8, against the metal in the premium One M8 and the latter did look quite premium, but the One E8 retains the placement of speakers, front camera and thus, the look of the phone doesn’t change. HTC has never been wrong with their smartphone designs, thus we don’t really have much to talk against, but the glossy back on the Polar White variant is simply not good – 1. It is a fingerprint magnet, 2. It gets scratches easily. The only variant with a matte finish, is the Misty Gray one. On the back, there is just the 13MP camera and LED flash above it, and towards the center of the device, hTC branding is seen with the silver finish. A secondary mic is also present, just beside to the camera. There is a very little but still a noticeable curve from center towards the side on the back of the device, and that is what gives the user a feel of this being quite a slim device, although in reality it is 9.9mm thick. With the polycarbonate body, the device is quite lighter than E8, at 145 gm. On the front, it’s two BoomSound speakers, one each above and below the display. Beside the top speaker, is an array of sensors and the front-facing camera. The power button is on the top, and I felt that to be little more embedded than it should be, and thus I could not notice whether the button was really pressed, most of the time. The other physical buttons on the device are just the volume rockers on the right side, and above that is a slot for the MicroSD card, and the two SIM card slots under a single pop-out tray are on the left. The display under the 5-inch Gorilla Glass 3 protected screen has a 1080p resolution, and it is very bright, with vibrant colors. The color reproduction is great, and viewing angles are good too. You won’t be enjoying the entire 5-inch diagonal real estate because the navigation buttons are located within the display, not out of it. In fact, the display quality is no different from that in the One M8. I am tempted to call this as one of the best displays around, given the good brightness and great color reproduction, but the Super AMOLED displays on Samsung’s flagship devices are still a winner. Another similarity with the flagship M8, is that the One E8 is running Android 4.4.2 and HTC has its own Sense 6 UI layered over it. This custom UI from HTC always has been colorful and intuitive. The on-screen navigation buttons hide themselves whenever you are in any fullscreen application or game. I have been a fan of devices that come with stuff where you don’t need to press the buttons to activate the screen, and the previous devices I used (LG G2, Gionee Elife E7 and LG G3) had that feature. The One E8 screen too gets activated with double tap, but that needs the phone to be held vertically, and it is more than just activating the screen because when you have the phone in portrait, swiping left from right corner launches the widget panel, and swiping right from left corner launches Blinkfeed. All this, when the screen is off. The lock screen presents itself with the lock icon and four app shortcuts (Phone, Messaging, Browser and Camera), and the large empty area isn’t wasted, as you can even there to unlock the screen. There’s even the large widget showing the time, date and weather information based on location. Blinkfeed has got better, with the news and updates from both news sources as well as from social networks. It brings some cool curated content for the users, but the bottom dock is annoying there as you cannot remove it, and it just takes away some space. The pre-installed apps include the Google apps, as well as Car Mode (a very good one with voice commands, large shortcuts such as navigation, dialer, music, etc. ), Flashlight, HTC Backup, HTC Zoe, HTC Dot View, HTC Guide, Kid Mode, Parent Dashboard, Polaris Office 5, Tasks, Voice Recorder and Weather app. Interestingly, Fitbit app too comes pre-installed, and only the Fitbit users have some less work to do here. The HTC Zoe app is in beta, and although the update was expected somewhere in September, we still see this in Beta stage. For those who aren’t aware about the app, it is an interesting feature that lets the user choose photos and videos to add them with some preset themes, to make a compilation video. 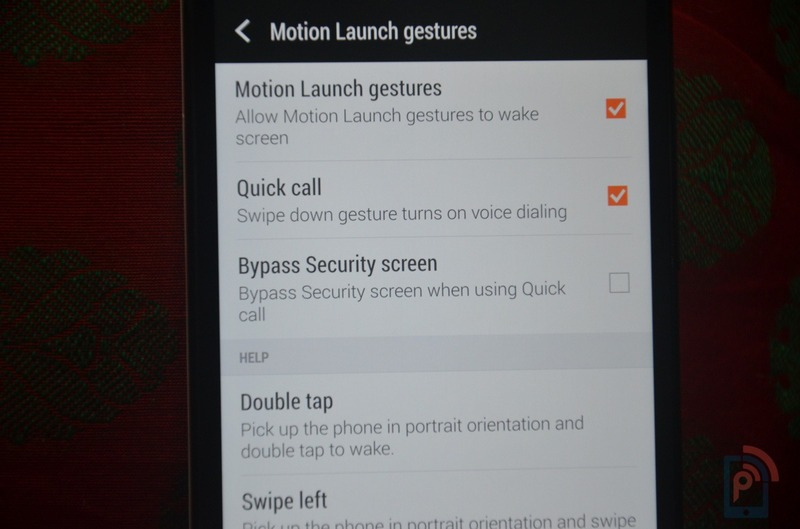 Gestures, and a lot of gestures, is what defines the Sense 6 UI. Go into the Settings > Phone > Display & gestures and you will see all the possibilities. In Portrait Orientation – Double tap to wake, swipe left to wake the phone and launch widget panel, swipe right to pick wake the phone and launch BlinkFeed, Swipe up to unlock, Swipe down to wake the phone and turn on voice dialing, and in landscape orientation, press the volume button to activate camera. There is an option to even let the app recognize 3-finger output gestures, and one example is in the car mode when 3-finger tap activates voice commands. The quick settings section is a big deal. There are some useful settings for connectivity, battery and modes. One can control brightness, toggle Wi-Fi, Bluetooth, Auto Rotate, Airplane Mode, Bluetooth, Battery Saver, Do Not Disturb Mode and the user profile. But, there is no easy way to go into the quick settings directly, as you have to pull the notification panel down, and then tap on the quick settings icon. 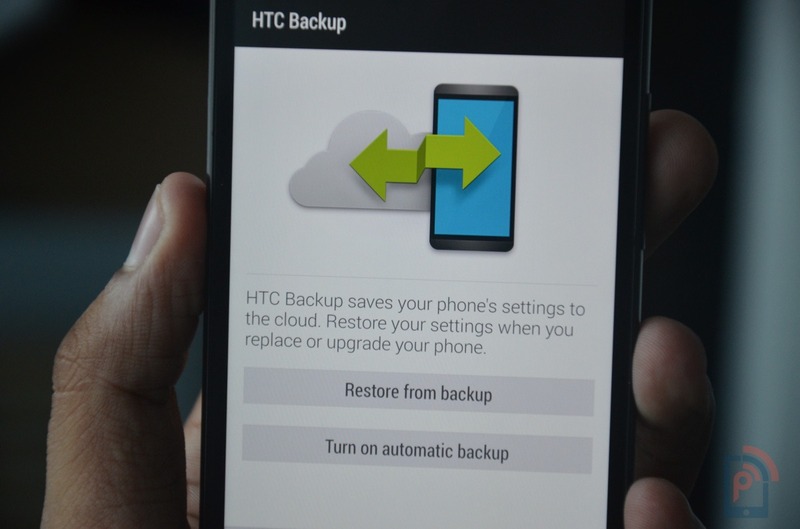 There’s an HTC Backup service that saves settings, home screen data, account details, bookmarks, wallpapers, etc. but it is limited to just that and the user cannot store photos, videos and such. 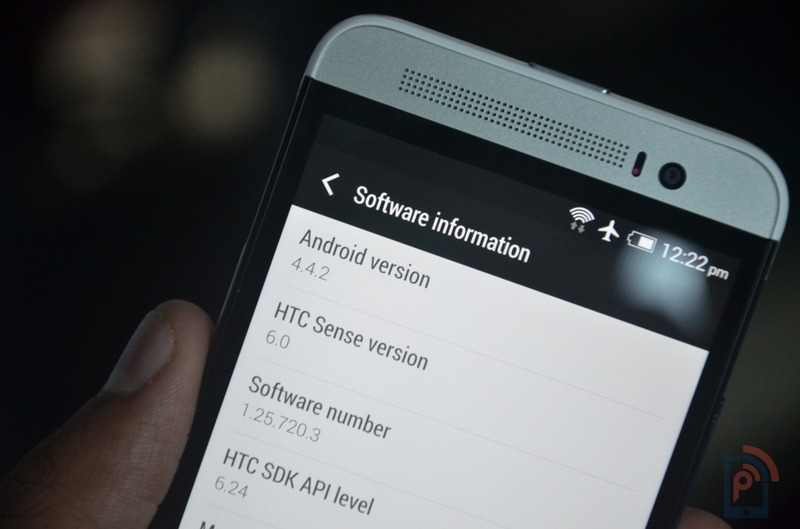 Overall, the HTC’s Sense 6 UI is interesting as always, and it is for us to see how much advantage we can take out of those loads of options given deep in the settings. You can call it an upgrade from the 4MP camera, only if you had no real idea about the UltraPixel camera of the HTC One M8, but the 13-megapixel shooter in the One E8 is a downgrade, with the camera not doing the best job, and comparing to the Moto X 2nd gen’s camera, the latter was better. There is a lot of compromise with the camera app features as well, as the HTC One M8 had some excellent modes to try out. The 13MP BSI sensor with f/2.2 aperture on the One E8 only does a decent job but it brightness the pictures unnaturally even when the conditions around are bright enough. The simple interface of the camera app does have a lot though, with the modes – camera, selfie, video, zoe camera, dual capture and Panorama 360. The manual settings can be done with White Balance, Effects, EV, ISO sensitivity. To save the battery, when the camera app is open but the user isn’t moving it at all, the app goes into standby and you have to tap on the screen to activate it again. The video recording is possible at 1080p Full HD resolution, and I like the way you get settings particular to each mode, rather than generalized settings that confuse the user. The quality of capture is good and the shakes are well negotiated and reduced, and the capture is at 60 fps. The shutter is fast and responsive, and there is no lag shown between pressing the shutter and the image being captured. It is similar in speed, when compared to the M8, and faster than the response you see in the Desire 816. Attached below are a few camera samples in the different light conditions. While the number says a lot, the quality doesn’t when we talk of the front-facing camera. It is a 5-megapixel shooter but it doesn’t do the job well at all. Lot of noise, and one would see a similar quality capture with even 2MP camera on the Moto X. 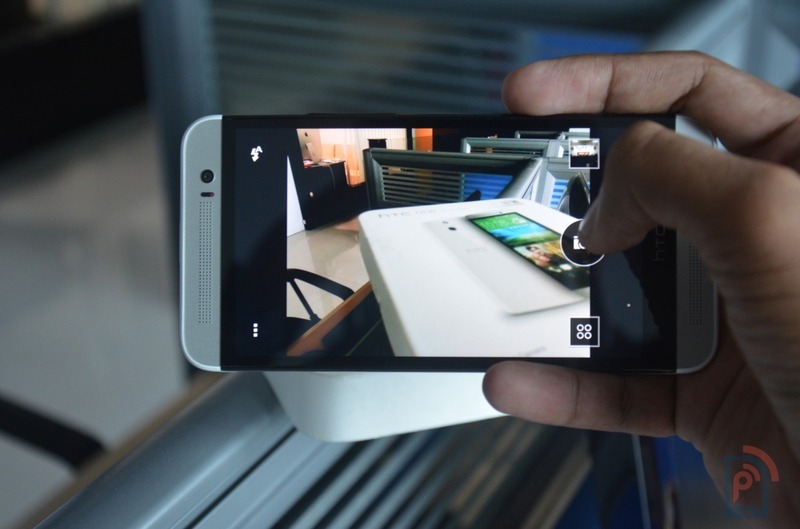 Check out the HTC One E8 Camera Review. Performance wise, the HTC One E8 is a powerhouse with a speed that one would expect from a Snapdragon 801 device, and the swift response, fast loading of apps keeps the user experience at its best. We opened several apps, switched between them and even played the high-end games such as Fifa 15, Dead Trigger 2 but the HTC One E8 didn’t break a sweat. It was flawless with the performance, and the real fun was with the gaming. The benchmark scores too were good enough to keep this device somewhere in the top list, but that is of lesser importance because the performance is what we put focus on, and two important things to notice – 1. No game showed even a little lag, even after using some heavy apps and switching to the game, and 2. Heating. This is one such phone which would get the best score for being the least heated on gaming. Fire up the Fifa 15 game on Sony Xperia Z3, Samsung Galaxy S5, Moto X 2nd gen and the HTC One E8, and you would see alarming heating on the first three devices, while the One E8 keeps itself cool. May be the plastic body is helping, but we are here looking for the best experience, not digging into the engineering. HTC One E8 clearly gives a better gaming experience than the others. While playing some HD videos, the One E8 never gave up and the beautiful display added to the performance to give it a perfect output. Here comes the next best thing to mention – Stereo speakers. The two BoomSound speakers produce excellent sound, and having the speakers on the front gives it like a surround sound. Even on the highest sound, the sound quality doesn’t change and we got the same crystal clear sound. To compare, the HTC One M8 had same speakers and the same quality of sound output. This being a Dual SIM smartphone, one doesn’t have to carry a secondary device for the second SIM card, as most of the flagships usually are made with Single SIM card slot. The wireless connectivity options include Wi-Fi, Bluetooth, Wi-Fi tethering, HTC Mini+ and NFC. Under normal testing, the HTC One E8 never lost a connection with the mobile network, and at places with low 3G signals, it did the best in having the lowest connectivity without a signal drop. Finally, the battery of the HTC One E8, at 2600 mAh is expected to do the best and last for long, at least for the entire day, but the battery life varied a lot especially when using Wi-Fi over data network. The difference was dramatic, because it took nearly half the time for same battery drain when browsing the web using 3G, when compared to the same on Wi-Fi. The One M8 had quite different results. What I liked with the battery saving options, is the Extreme power saving mode, which conserves CPU usage, reduces screen brightness, turns off vibration feedback, turns off data connection when screen is off, allows only the essential apps to run, and turns off pedometer. The best part is, you don’t really have to get into each setting and turn these off always, and these are some things that won’t alter the experience of device usage, but would save battery at the same time. One after the other, HTC is bringing out quality products in the market, although the sales statistics don’t support them much. But with the One E8, the pricing is very apt and HTC has managed to launch this at a price point where there is only one perfect competitor to this – the Moto X 2nd gen. Both stand at the same level with performance, but Moto X is winning with the camera, while the One E8 heats up lesser on heavy usage. The stereo speakers on the One E8 though, gives another reason on why one should choose the E8 over Moto X. Mixed thoughts for the One E8, especially because although most of the things are near perfect and the device is priced right, the camera is not the best, battery life isn’t promising and the polycarbonate body takes away all the classy feel while holding the device.